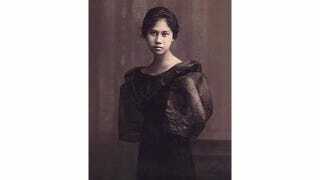 Christine Del Castillo comes from a long line of fabulous Filipina women. With jasmine in her hair and ylang ylang tucked in her cleavage, her great-great grandmother Nitang (pictured above) left a trail of men in her wake. Soledad, Christine's mother, owned a clothing boutique in the Philippines and was a style icon in her own right. Though some subjects were off-limits (body hair, in particular), when it comes to beauty, the matriarchs in Christine's family led by example. She tells us what lessons she brought with her to America. Skincare essentials include a cleanser, toner, some kind of astringent, a moisturizer and sunscreen. Sunscreen everywhere. I went white water rafting in my grandmother's province and there were women in my family who didn't want to get tan. So even though we were white water rafting and it was really hot, they were in long-sleeved shirts, scarves around their heads, SPF 80. I live in the U.S. now so I was just thinking, "Have fun with that!" My attitude was a bit different before, because I was socialized as a young child to think that I'd be prettier if I was light-skinned. I actually have trauma about it. At a preschool Christmas pageant most kids were cast as angels or elves, and I couldn't help but notice that all the light-skinned girls were angels. I was just like, "But I want to be an angel… I'm an angel!" In a lot of places it's still more common to think of light-skinned as being pretty. Actually, the last few times I visited the Philippines I couldn't even find sunscreen – just skin lightening products. But in other places people are starting to own their natural color, which is good. My mom was the first person to teach me about makeup, but the makeup she used was… different. As a young girl, it's not like I'd wear her red lipstick. Everyone would know I was wearing lipstick. The makeup effect we wanted as teenagers was very natural, very subtle – to look like we weren't wearing anything. In high school, we all carried these kits full of little products: a pressed powder compact, a hairbrush, face wash, those oil absorbing papers and lip gloss. It wasn't uncommon for all the girls to go to the bathroom together at lunch to wash our faces and then reapply everything. Get rid of it all. But it's not really something your mom or grandmother talks to you about – there's not a lot of conversation about body hair. At 13 or 14, though, it's probably time to start grooming your face, and it would be like, "Ok, you're a woman, we're going to do your eyebrows." And eyelash perms and eyelash extensions actually happen. My mom took me to get a lash perm as a teenager and also cut my eyelashes when I was a child so they would grow longer. I think it worked. When I was growing up, really long, shiny, blue-black hair was the thing to have. Other colors are becoming more mainstream but there's still this feeling that young women should be very, very natural. Keratin treatments or "straight perms" are also popular on women born with thick, coarse or wavy hair. My mom and grandmother weren't open to me experimenting, but when I moved to America everyone was like, "Oh god, you're so wholesome! Let's dye your hair and give you piercings!" My mom's reaction was actually amusement. Her friends would come over and she would say, "Christine, lift your shirt and show them your navel ring!" Philippine food is very good but it isn't that healthy. Because my family genetically has a fast metabolism, they didn't pass down any fitness habits; I had to develop those on my own. The only diet tip they passed on is that what a woman eats while pregnant will affect the personality of her child. So if you're eating lots of sour food, you'll have a sour-looking baby. If you're eating spicy food, he might be hot-tempered. It's more of a courtship culture, so there's an interesting attitude around dating that's maybe not present in the U.S. Men are tasked with the responsibility of wooing a woman, and a woman probably has many suitors. It's actually frowned upon when a man courts too many women. They call him a Chick Boy. The women aren't dating all of these men, they're just sort of accepting the attention, so that's completely acceptable. The Philippine version of America's Sweetheart – how they describe celebrities – actually translates to Crush of the Country, because literally everyone has a crush on this person. It's a whole "collect and select" thing, where you try to amass as many prospects as possible. Who has time for that? Previously: How to Be Pretty in Iran.